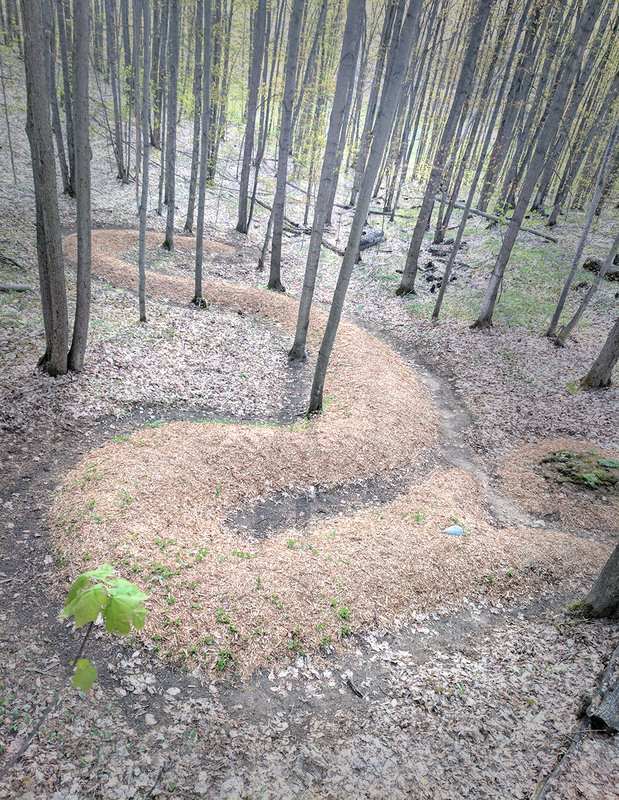 In 2002 environmental artist, Patricia Innis, completed the installation of a 120 foot Serpent Mound. The Serpent winds its way through the woods and has an open mouth about to swallow an egg. The Serpent is 2-3 feet in height and 5-6 feet at the base. Both the serpent and the egg are made of sand covered with a layer of top soil and mulch. Sweet Woodruff ground cover blankets the serpent while moss grows on the egg. The serpent references the ancient mound building people who came from the Mississippi River Valley. As the Ottawa migrated into what is now Michigan, their legends tell of finding the Yam-Ko-Desh, or Prairie People, who were “thicker then leaves on a tree.” The many mounds and small animal sculptures they left behind testify to their existence in the state. Innis worked with students from three school systems to create ceramic animals to bury in the mound. Each animal carries a wish for the world. Animals students wanted to see increase in the world were buried in the serpent, while things they wanted to eliminate were buried in the egg. As well as paying homage to the Yam-Ko Desh people, the Serpent would also represent the numerous types of snakes inhabiting Michigan. Serpent Mound was paid for by grants from The Michigan Council for Arts and Culture and a private family foundation.